Hotel Happy Home is an abode for travelers satisfying their wanderlust in the lap of Kumaon Himalayas. Have a nostalgic stay at the stately hotel which offers impeccable services, luxury and leisure at budget friendly price in Haldwani. Get allured by the contemporary decor and the charming ambience of the hotel. The hotel is easily accessible as it is located in the heart of the city. It is an ideal retreat for the corporate personnel, bagpackers, international tourists and students. 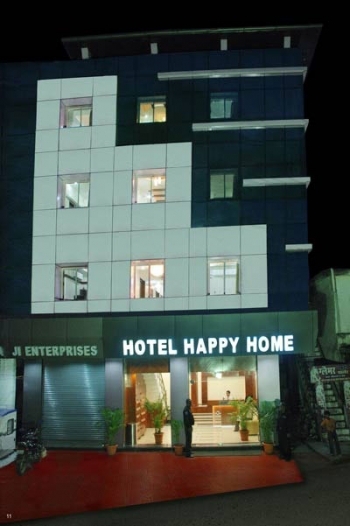 Hotel Happy Home has another sister hotel in Nainital, named as Hotel Happy Home Nainital. The hotel is located on Nainital Road at Bhawani Ganj in Haldwani. The hotel is at a walking distance from the Railway Station, Roadways, Kaladhungi Chauraha, Mangalparao etc. It is located close to Bombay Crockery House. The hotel offers accommodation in well furnished Deluxe, Luxury and Standard Rooms. The elegantly designed rooms are perfectly fashioned which possess a modern decor. The spacious rooms comprises of an attach bathroom, hot/cold running water, wi-fi, power backup, television, complimentary furniture, clean beds and duvets. The hotel possess its very own fine multi cuisine restaurant. The rich aroma of the savor dishes will increase your appetite. Have scrumptious meals with your loved ones and enjoy the tasteful food at the pleasant ambience of the hotel. The hotel is situated on Nainital Road at Bhawani Gunj in Haldwani. Haldwani is well connected by motorable roads from major destinations of Uttarakhand. A large number of tourists who visit Haldwani embark their journey from New Delhi which is 275 kms away. State owned buses as well as luxury buses are easily available to Haldwani from ISBT Anand Vihar. The hotel is at a proximity of Haldwani railway station. Haldwani is well connected by railway network with major destinations of India like Lucknow, Delhi and Kolkata. Trains run frequently to Haldwani and daily trains run between Delhi to Kathgodam and vice-versa. Pantnagar Civil Aerodrome is the nearest domestic airport from the hotel. Taxis are easily available to Halwani from Pantnagar airport which is barely half an hour journey. The nearest international airport is Indira Gandhi International airport at Delhi. It is well connected with major cities all over the globe.